Capture the attention of all the important minds in your next board meeting with our Drywipe Marker Bullet Tip Black 20 Pack. Suited to all manner of environments from the office through to the classroom, these easy grip markers have a slim lined design that is comfortable enough for those longer than planned meetings. The removable ink can be wiped clean off of traditional whiteboards with the swipe of a dry cloth while the low odour formula dries instantly to reduce the risk of pesky smudges. 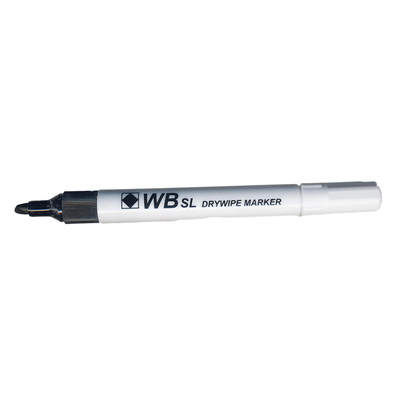 A great tool for both adults and children alike, each drywipe marker can be used with smaller board to engage a group or to pick out key facts when presenting your latest findings to a larger meeting. The 10 pack offers a suitable option for replenishment stock or when purchased for specific group activities. When it's larger classrooms or meeting halls you are looking to supply, we have our Drywipe Marker available in a large pack of 100 - suitable for replenishment stock or individual use. We also stock our Mini Magnetic Whiteboard Erasers in boxes of 30 as a suitable alternative to dry cloths, along with our Drywipe Markers in an assortment of different colours.